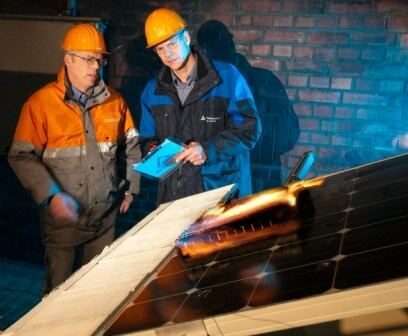 The fire-resistance of solar panels on wooden roofs is a frequently asked question by property owners and authorities in charge of releasing building permits. One point to be addressed is the possible increase of the flammability of the roof, and its effects on the building’s safety. Another concern is about the exposure of first responders to the risk of electrical shock in case of fire on a building with solar panels on the roof-top. 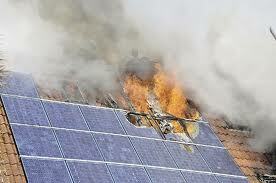 1) Can solar panels trigger and transmit a fire? Solar panels from major manufacturers comply to the IEC 91730 standard. According to the IEC testing procedures any product matching the test is guaranteed as capable of  not inducing any fire if subject to fire close to its surface,  not transmitting fire in case of a burning material left on its top – as it might be the case of a blazing object blown by the wind – and  do not loose its structural resistance during the test. Testing procedures from the TUV Germany are available here. Another point is the fact that the only inflammable point of a solar panel is the junction box, which is made of uninflammable material, but it may host a flame triggered by electronics components, in case of a failure in the isolating material of the wiring connection. 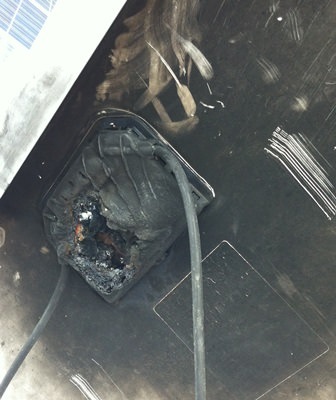 The worst that we have seen is that the PVC which the junction box is made of melts down, but the fire did never receive fuel enough to keep burning or to spread the ignition to the roof. Our statistic (based on about eighty solar plants under maintenance service since 2008) shows that it happens in less than 0,001 % of the installed panels, and actually it happens soon after the installation and regardless of the installation mode – which let us believe that the cause is a defective production. Indeed, as a junction box burns out, the DC circuit connecting the panels along a string opens up with two effects: to isolate the faulty panels from the other, and to stir an alert into the string monitor system (if there is one installed). 2) Can a solar panel increase the chance of flammability of a wooden roof? There are two facts about fire:  fires go bottom-up (unless there are accelerants increasing the fire’s ignition point toward other directions);  fires require fuel, heat and air to keep burning. Solar panels are mounted on the top of the outer roof’s layer, so there’s no way the flames can spread underneath; the mounting structure is made of Aluminum and steel; cables and connectors are made of flame-retardant material. Even in case of strong winds from the panels’ side of the roof, the lack of consistent fuel in the back of the modules prevents the ignition of the roof’s outer layer and the timber beams underneath. The commonly used roofing system (clay tiles, tin roofs, asphalt built-in coverings) are made of original flame-retardant raw material. In any other case – as is the case of wood shingles – it is advisable to install a flame-resistant intermediate layer on top of the non-flame-retardant layer as additional safety. Generally speaking, we can assume that solar panels do not add the fire-resistance risk of a wooden-roofed building, provided that the roofing cover has been correctly built of a commonly available flame-retardant material.